Many large corporations hold training sessions for employees all together in Sydney. Often time’s new trainees may be arriving from all over Australia. Using a mini bus service to get your employees from their hotel to your training facility is an economical, quick, convenient way to make sure everyone arrives at the same time and on time. The time in the van also gives employees some time together to socialize and get to know one another. Conversation inevitably spark and there is a great opportunity for relationship building. All our drivers are happy to give suggestions to your employees on the best places to eat, or the best watering holes to visit. 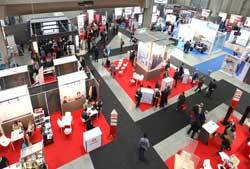 We are happy to assist you for your tradeshows and exhibitions. We have a number of different size mini coaches available in our fleet as well as trailers with advanced notice. If you need to transport large displays we can arrange direct transport from the airport to the venue or your hotel. When you fill out the Quick Quote online please put a quick note in and a logistics specialists will be happy to help you. Sydney is a city full of activities. With 100 golf courses, a number of national parks, wine country, aquatic sports of all kinds, parks, beaches, the botanic gardens the opera house, the harbour bridge climb and many many more there are so many activities available for corporate team building. Use a private mini bus for team building events to help foster the team environment from the beginning of the day all the way through to the end. Excellent companies recognize that what makes them great is their human capital. The best of the best realize that recognition of employee achievements goes a long way in encouraging high performance. Within a two hour drive of Sydney or in the CBD there are hundreds of ways to show your employees you appreciate them. For small groups there are discounts to many of Sydney’s attractions. For larger companies you can even rent an entire park or choose one of the awesome venues in the city for parties. Concord Coaches provides excellent service to all our clients. Whether a social group of six going on a golf trip or spa day, or a corporation in need of a fleet of minibuses to provide event transfers daily for a week there is an ideal solution for you. Choose from economy coaches or luxury coaches.